At the controls of the Splendid restaurant, chef Grégory Chevalier revisits the products of the local culinary heritage with one ambition: to make it light and accessible to all. 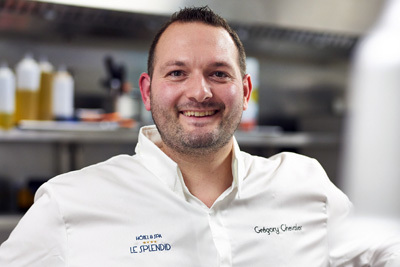 Originally from Périgueux, the young chef apprenticed with the Charbonnel brothers in Brantôme. Attracted by the French Riviera, he then spent about ten years in Cannes and Nice, where he discovered the vegetables and sunshine of local cuisine. At 35 years old, the chef returns to his homeland to work in the Splendid: he offers a gourmet cuisine from the South-West, but at the same time lightened by his Mediterranean experience. Gregory Chevalier’s bet? Make the pleasure of eating accessible and discover local and seasonal products, something to delight your taste buds! Ducks, geese, pigs, trout, hake, squid… not to mention foie gras… are honoured in the exceptional setting of the Splendid. Several local producers provide the cuisine of this chef, who knows how to enhance classicism while adding a touch of modernity. Steamed asparagus from Darrigade farm, soft-boiled egg from Etcheleku farm, dried rolled breast from Vallons farm, poultry juice and young spinach shoots. Roasted pork hazelnut from the farm of Les Vallons, celery mousseline, candied potato palets, snacked sucrine, sherry vinegar juice and peanut crumble. A new “my way” of making a dacquois biscuit: creamy pistachio dacquois biscuit, fresh strawberries, crispy strawberry and old balsamic vinegar.